"Solutions" is a mid-career survey of Cassils, an artist whose work addresses issues of self-representation and public resistance experienced by transgender and non-binary individuals. Using various mediums - photography, sculpture, video, performance, and installation - Cassils highlights the fluidity of gender identity. 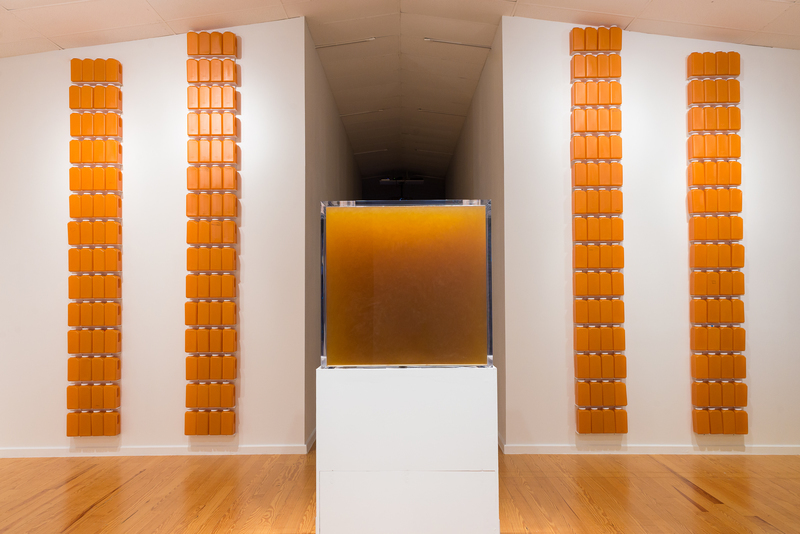 The exhibition’s centerpiece, Pissed (2017), appears as a riff on Minimalism's stoic cube. But further viewing reveals insides that are in constant motion. Originally the acrylic structure stored 200 gallons of the artist’s own urine collected since Trump’s rescission of an executive order allowing transgender students to use the bathroom matching their gender identities. This 2018 remounting displays urine gathered from Houston citizens during a months long "piss drive." The work hopes to begin conversations in a city where a 61% of voters rejected a 2015 anti-discrimination ordinance amid fears it would allow male sexual predators entry to women's bathrooms.